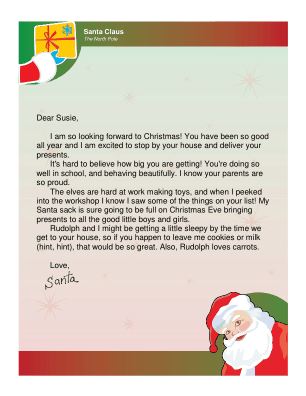 This printable letter from Santa promises a Christmas Eve visit and suggests that the child set out cookies and milk, and maybe a carrot for Rudolph. I am so looking forward to Christmas! You have been so good all year and I am excited to stop by your house and deliver your presents. It's hard to believe how big you are getting! You're doing so well in school, and behaving beautifully. I know your parents are so proud. The elves are hard at work making toys, and when I peeked into the workshop I know I saw some of the things on your list! My Santa sack is sure going to be full on Christmas Eve bringing presents to all the good little boys and girls. Rudolph and I might be getting a little sleepy by the time we get to your house, so if you happen to leave me cookies or milk (hint, hint), that would be so great. Also, Rudolph loves carrots.